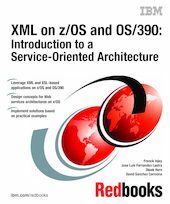 This IBM Redbooks publication describes the use of XML on IBM servers running z/OS or OS/390, and how it can be extended to modernize legacy applications. It provides both a high-level discussion of service-oriented architecture along with practical, detailed information about XML. In addition to an overview of XML concepts, the first part of the book provides detailed instructions for installing the XML Toolkit for z/OS and OS/390 V1.4 and running the sample programs bundled with it. It describes how to use various tools that are part of the services development environment, details the support for XML in Enterprise COBOL, and provides an overview of the IBM WebSphere Application Server. This material is of interest mainly to system programmers and application programmers. The second part of the book is geared more to the needs of application developers and architects. It provides a comprehensive introduction to service-oriented architecture (SOA) and Web services, and describes in detail some service-based topologies for both legacy systems and new applications. Finally, this book presents some important design concepts to enable the reader to build robust SOA-based solutions rapidly. This includes an introduction to the IBM Patterns for e-business, as well as XML-based message design, and the principles of design by contract and service design.